As you plan your next move, consider how your next home purchase might affect your wealth and future lifestyle. It is no longer obvious that purchasing is the right decision in your leisure years. 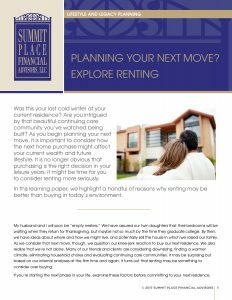 That’s why, in this learning paper, we highlight a handful of reasons why renting may be better than buying in today’s environment. For anyone who hopes to maintain at least a middle-class lifestyle, a degree from a higher education institution has become a must. 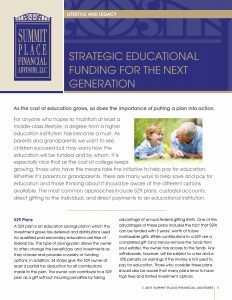 As parents and grandparents, we want to see children succeed but may worry how the education will be funded and by whom. 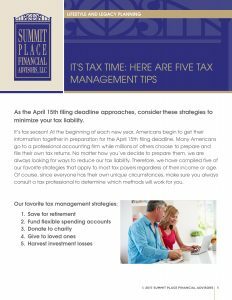 It’s tax season and the April 17th filing deadline is near. We know you are always looking for ways to potentially lower your tax bill: consider these tips when you file this season’s taxes. Markets can be very uncertain at times with major indices dropping and recoving multiple times in just a few short months. 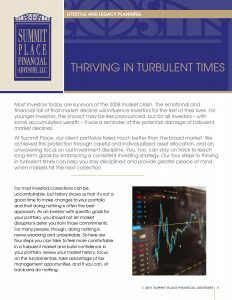 Major media programs make things even more uncomfortable by telling investors that the markets are in turmoil and will possibly become worse. 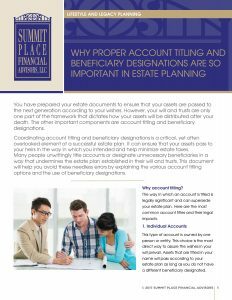 You have prepared your estate documents to ensure that your assets are passed to the next generation according to your wishes. However your will and trusts are only one part of the framework that dictates how your assets will be distributed after your death.